One of the few things my ex-wife left me with was this album. It sat in a box for a few years until one day I pulled it out curious to see if she had any real taste in music. My my my ... how I was surprised. I knew that The Flaming Lips were good, but I didn't imagine that this album would be on heavy rotation on my CD player. In The Morning of the Magicians has got to be one of my favorite Flaming Lips songs of all time. "There's the real world and then there's this fantastical world. This girl, the Yoshimi character, is dying of cancer. And these two guys are battling to come visit her in the hospital. 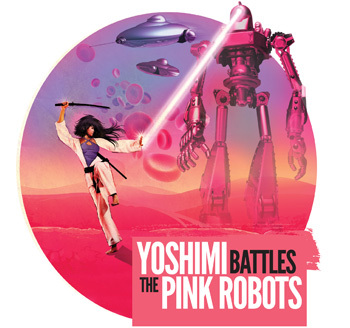 And as one of the boyfriends envisions trying to save the girl, he enters this other dimension where Yoshimi is this Japanese warrior and the pink robots are an incarnation of her disease. It's almost like the disease has to win in order for her soul to survive. Or something like that."